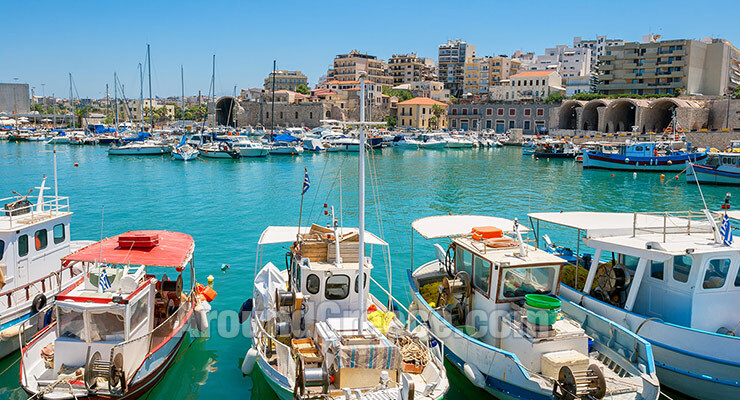 The county of Heraklion is situated between the counties of Rethymno and Lasithi, and is the most developed in part of Crete in terms of tourism offering many options for holidays and accommodation in a beautiful and historic location. During the Minoan period, Heraklion was at it's peak, as it was the most important center in every aspect of a civilization. In Heraklion some of the most important and famous archeological sites of Crete are found, such as the palace of Knossos, and also the important palaces of the Minoan Crete, Festos and Malia, which attract great numbers of visitors from all over the world. 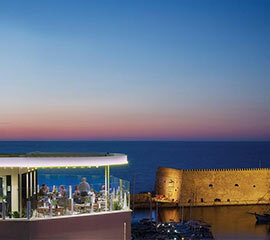 Heraklion is today, one of the most well developed cities in Greece. 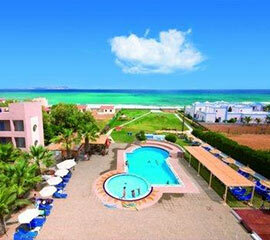 It has many large hotel complexes and caters for all types of accommodation and entertainment requirements. In Heraklion are large hospitals, Universities, and colleges of various expertise. The morphology of the region is of greatinterest, as tall and large mountains stand dominant around the area, impressive caves appear through natural paths, and wonderful sceneries that have stood still through the centuries, all combine to create the magical setting that is Crete. The landscape perfectly compliments the wonderful beaches and coasts that spread along the prefecture. 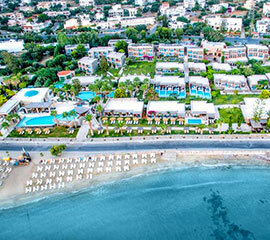 Here visitors can enjoy the crystal clear waters and organized facilities for a wonderful day on the beach. There are of course other organized beaches that offer water sports and entertainment services, as well as many beaches that are isolated and away from the large and sometimes noisy crowds. Some of the most popular beaches in Heraklion are Agia Pelagia, Ammoudara, Gouves, Kalamaki, Matala, Paleokastro, Keratokampos, Loutra, Kommos, Kali Limenes, Timbaki, and many more. Although Heraklion is a modern city, it still preserves its Venetian character that was distinguished during the Venetian occupation. Impressive structures and squares such the Eleftheria Square, the Lions, the fountain Bempo, the Venetian Castle at the port’s entrance, the Archeological and Historical museum of Crete, the Byzantine monasteries and basilicas all these reflect the glorious past that is full of history and heroic tales, about a great place. The city is one steeped in history and culture and this is evident from the moment you arrive in the city and begin to see the various sights and places of interest. 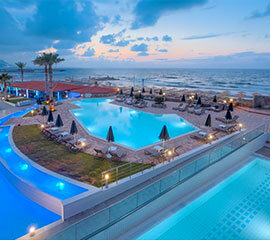 Heraklion has much to offer visitors to Crete, and is an extremely beautiful and natural part of the island. If you head out of the city, you will begin to discover just why this part of Crete is so beautiful and appreciated. 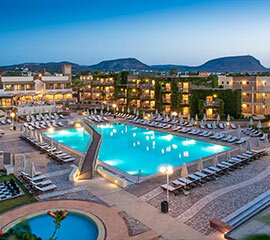 For your travel and holidays to Heraklion you will be able to find a huge range of quality accommodation for your stay. 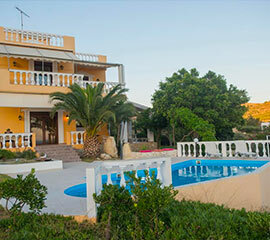 The county has a huge range of hotels, resorts, apartments, studios and private villas. There are many resorts that offer comfortable accommodation and facilities including swimming pool, gardens, bars and restaurants which are ideal for those who may be travelling in a group or with young children. There are lots of great destinations for holidays in the Heraklion region of Crete, including the coastal resorts of Hersonissos and Malia - both of which are popular with youngers travellers. Some of the other locations in the region are popular with those who are looking for a more peaceful and relaxing holiday. Whatever your budget and requirements, you will easily be able to find the accommodation that suits your specific needs. There is something for everyones budget, so whether you want your own villa with a pool, or a more basic apartment or studio, then it won't be a problem to find it.